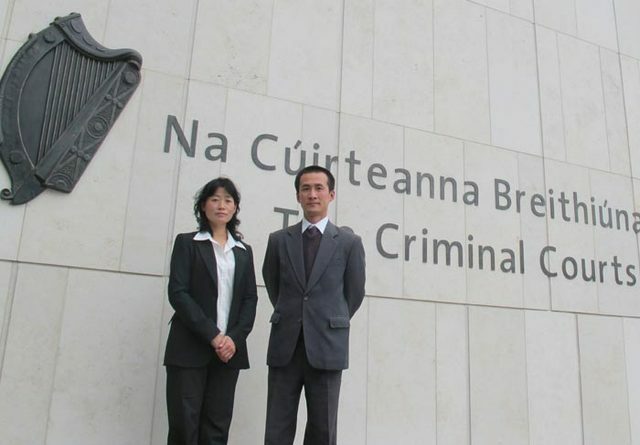 On September 27, 2010, the second day that Li Changchun, a standing member of the Politburo of the Chinese Communist Party (CCP), was visiting Ireland, Falun Gong practitioners, including Ms. Dai Zhizhen from Australia, filed a criminal complaint to Dublin District Court against Li Changchun for his major role of commanding and implementing the crimes of torture, killing, inhuman abuse, and genocide against Falun Gong practitioners during the period of time when he served as the CCP Party secretary of Guangdong Province, and as a standing member of CCP's central Politburo. The court officially accepted the case at 4:00 p.m. that same day. Li Changchun had before been brought to a court in France, charged with crimes of torture by Falun Gong practitioners. Dai Zhizhen and Zhao Ming, September 27, 2010. The criminal complaint states that the defendant, Li Changchun, had directed extinctive persecution toward Falun Gong practitioners when he was as the CCP Party secretary of Guangdong Province. According to reports by World Organization to Investigate the Persecution of Falun Gong (WOIPFG), Li Changchun had in Guangdong Province directed and implemented the persecution of Falun Gong practitioners, using brutal means, causing hundreds of Falun Gong practitioners to be sent to labour camps in Guangdong, The practitioners were subjected inhuman brainwashing, torture, and killings. According to incomplete statistics by the Clearwisdom.net website, Guangdong Province has consistently been one of the worst provinces in China in terms of persecuting Falun Gong practitioners, with at least 76 death cases by persecution, from the time Jiang Zemin, the previous President of China, launched the persecution in 1999, until September 2010. The lawyer representing Falun Gong practitioners has pointed out that Li Changchun, as a standing member of the CCP central Politburo, as well as the person in charge of propaganda and media, played a key role in implementing the CCP's policy of repression and extermination of Falun Gong. He manipulated the CCP's propaganda tools to demonise Falun Gong through continuous, thorough, extensive, official, and unofficial means, using the media. The Chinese population without knowing the truth was thus deceived into hating Falun Gong. Meanwhile, he had commanded the police forces in public security, labour camps, prisons, and mental hospitals to arbitrarily and illegally detain, and brutally attack and torture those Falun Gong practitioners who persisted in their faith. After the case was accepted, Falun Gong practitioners in Ireland requested the court to issue an arrest warrant immediately for Li Changchun during his visit, so as to prevent the defendant leaving Ireland. According to the Irish "Criminal Law (United Nations Convention Against Torture) Act 2000" and the Irish "Genocide Bill (No. 28 / 1973)," if plaintiffs and defendants in the crime of torture are both in Ireland when the case is brought to an Irish court, the Irish court has jurisdiction regardless of the nationalities of the plaintiff and the defendant. Regarding the crime of genocide, in accordance with the practice of international human rights laws, the Irish court also has jurisdiction regardless of the defendant's nationality and the place where the crime occurred. Practitioners from Ireland Celebrate 11th World Falun Dafa Day and Respectfully Wish Great Revered Master Happy Birthday!